The Pitch: Creative's Xdock has gotten a significant upgrade that allows users to upconvert their video to 720p or 1080i resolution and your music to X-Fi Xtreme Fidelity. That means that the Xdock HD can play video on an HDTV in full DTS surround sound and wirelessly play music through X-Fi Wireless Receivers connected to speakers anywhere in the home. Plus, it plays nice with the new iPod Nano and even previous-generation iPods —so you don't need to upgrade your player to enjoy the show. Available in Spring 2008 for $399.99. The Creative Xdock HD is the only iPod dock that upconverts your video to 720p or 1080i resolution and your music to X-Fi Xtreme Fidelity®. The Xdock HD plays video on an HDTV in full DTS surround sound and it can also wirelessly play music through X-Fi Wireless Receivers connected to speakers throughout the home. 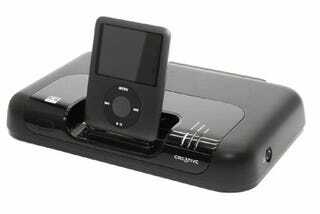 The Xdock HD is designed for use with the iPod® Touch, new iPod Nano and previous-generation iPods. The Xdock HD connects to a home theater system via HDMI, or it can be connected with component or composite for video and analog line-out or optical line-out for audio. While it docks and charges an iPod, the Xdock HD outputs a menu to an HDTV screen which users can navigate with the included wireless remote to select videos, music, photos and podcasts stored on select iPod models. Users can also adjust video settings including skin tone correction, luminescence sharpening and color saturation. The remote also controls audio functions including volume and the X-Fi Crystalizer® and X-Fi CMSS®-3D. In addition to connecting directly to your home theater system, the Xdock HD can wirelessly distribute music throughout your home to X-Fi Wireless Receivers up to 100 feet away without requiring a wireless network. There are two different modes you can select for wireless distribution of music in your home: broadcast to all receivers simultaneously or select individual zones. The Xdock HD and each X-Fi Wireless Receiver can be controlled with its own remote to activate X-Fi Crystalizer and X-Fi CMSS-3D, adjust volume, and control video and music playback. The Creative Xdock HD includes one X-Fi Wireless Receiver to wirelessly connect to a pair of remote speakers, and will be available in Spring 2008 for US$399.99. Additional X-Fi Wireless Receivers will be available for US$99.99.